Advent has a dual theme. It reminds us that there are two things on the way namely, the first and the second coming of Jesus. Advent is a time when we prepare ourselves for the first coming of Jesus –which we will celebrate at Christmas. It’s also the time when we think about the Second coming of Jesus when he comes again in glory on the Last Day. As we go through the Sundays of Advent the focus increasingly turns towards the celebration of Christmas. It is the custom of most Anglican and Roman churches to use an Advent candle wreath to mark out the journey through Advent. Each Sunday another of the Candles is lit until finally at Christmas Midnight Eucharist the white candle in the middle is lit to announce the birth of Jesus. 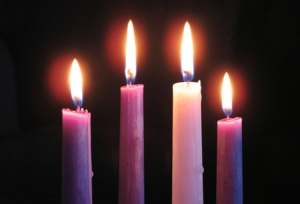 Because Advent is a season of preparation (and penitence) the colour of Altar cloths and Clergy vestments is purple. At Christmas we celebrate the fact that God came in person to rescue us! His willingness to help, his vulnerability and the type of people he entrusted himself to all tell us important things about his values and priorities. Christmas begins after dark on Christmas Eve. We’re used to the idea of days ending and beginning at midnight but there are a number of instances where the church follows the more ancient Jewish practice where days begin and end at sunset. 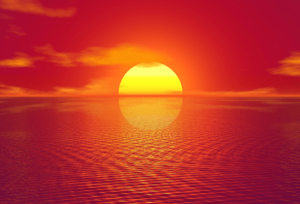 The hours after sunset are the beginning of the new day – they are the vigil or the ‘Eve’ of the new day! 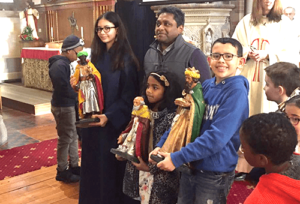 Most Anglican and Roman Catholic churches hold candlelit services during Christmas Eve and in most Churches there will be a Christmas crib – a visual reminder of the first Christmas in the form of a manger and small statues of Mary, Joseph, the shepherds and probably some animals as well. The ‘invention’ of the Christmas crib’ is usually ascribed to St Francis of Assisi who wanted to provide people with a visual aid that would help them to really engage with the amazing things that we celebrate at this time. The statue of baby Jesus is normally placed in the crib just before the Eucharistic prayer at Midnight Eucharist. Christmas is a celebration of Jesus’ life – so the colour of the Altar frontal and clergy vestments is white. The Feast of the Epiphany (which takes place immediately after the 12 days of Christmas) is the day when we celebrate the arrival of the Magi or ‘wise men’. In our churches the crib scene remains but the statues of the shepherds will have been removed and during the service they are replaced by statues of the wise men. Epiphany is a celebration of Jesus’ life – so the colour of the Altar frontal and clergy vestments is white. The feast of the Epiphany is the beginning of a 40-day ‘Season of Epiphany’. This is a time when our Sunday Gospel readings seem to make Jesus grow up remarkably quickly only to return him to being a child again at the end of the season. The reason for this strange feature is found in the term ‘Epiphany’ which is a Greek word which means ‘something that is shown or ‘revealed’ to you.’ The Sunday Gospel readings are all about Jesus’ person, mission or power being pointed out or revealed in instances such as his baptism and first miracle at the wedding at Cana. 40 days after Christmas the season of Epiphany comes to an end with a special festival called The Presentation of Christ in the Temple also affectionately known as Candlemas. Forty days after a birth Jewish families would have a special service to give thanks for the birth of the child and to mark the purification and return of the mother into outside society. 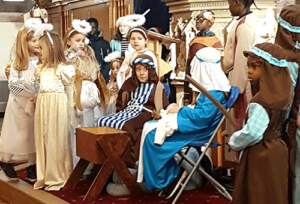 Because they are still living close by Mary and Joseph take Jesus to the Temple in Jerusalem where they are met by two special people, Anna and Simeon who recognise that Jesus will be the Messiah who gives light to both Jews and non Jews alike. 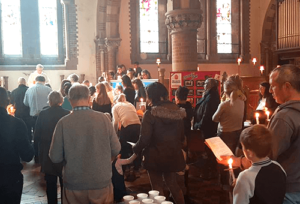 This theme of light is reflected at the end of the service when the congregation carrying candles all process to the font or main door saying or singing a musical setting of the words that Simeon said as he blessed Jesus. There are two section of ordinary time in the church’s year; this is the first section and we sometimes refer to it as the “ Sundays before Lent” Ordinary time is when we aren’t in any other season and in our Sunday Gospel readings we begin to read our way through either Matthew, Mark or Luke depending on whether we are in Year A, B or C.
The gospels tell us that for 40 days Jesus fasted and prayed in preparation for his ministry. Lent originally mirrored this by being a special time when adult candidates fasted and prayed and were instructed in preparation for their baptism on Easter Eve. As time went by more and more people began to use this time as a way of joining Jesus in facing our temptations, reviewing our spiritual health and preparing ourselves spiritually for Holy week and Easter. Lent begins on Ash Wednesday. 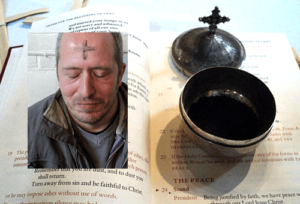 In response the priest places the ash on our foreheads in the shape of the cross – the sign and symbol of forgiveness. The ash is made by burning the palm crosses of the previous year. Lent lasts 40 days – from Ash Wednesday till sunset on Easter Eve. (You don’t count the Sundays). Because it is a time of penitence and preparation the church’s colour is purple. The last week of Lent is also known as Holy Week – the most holy week in the Christian year. It begins with Palm Sunday when we remember the day when Jesus entered Jerusalem riding on a donkey and how the crowds welcomed him by shouting, singing and waving branches from palm trees. We also remember how quickly the crowds began to turn on him when it dawned on them that he had not intentions of being a political or warlord Messiah. On Palm Sunday the main service has two parts. We begin in a place other than the main church building. 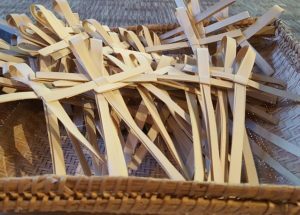 After hearing the Palm Gospel we carry palm crosses as we journey to the church and in so doing we accompany Jesus on his journey to the Temple. After his dramatic arrival Jesus simply spends the next few days healing people and teaching in the temple. Every evening he travels out to Bethany the home of Mary, Martha and Lazarus. Wednesday is traditional known as ‘Spy Wednesday’ the day when we remember Judas making the deal to betray Jesus. The most special part of Holy Week runs from sunset on Maundy Thursday to sunset on Easter Sunday. This is often referred to as the Easter Triduum or the Three days. To understand the background and to understand why we say that Jesus rose on ‘the third day’ it’s important to know something about the Jewish day. We think of the day beginning and ending at Midnight but the Jewish belief and therefore in the biblical way of thinking was that a day ends when the sun has gone down. So one day ends and the next begins at sunset. So in the Jewish/ biblical way of thinking the time between the Last Supper on Thursday Night till the night of Easter Sunday looks like this. So many things happen on the first of the sunset to sunset days – Jesus has the Last Supper, he is arrested, tried, crucified and buried. On the second day (Friday sunset to Saturday sunset) nothing visible happens but then on the third day, which begins at sunset on Saturday, something happened that changed everything. The resurrection took place at some point during the hours of darkness. After sunset on ‘Maundy Thursday’ Jesus and his disciples had the Last Supper in an upper room in a house in Jerusalem. Because none of the disciples are willing to acknowledge that they are the ‘least’ in status in the group none of the group are willing to wash the feet of the others when they arrive for the meal, so Jesus himself gets up and washes the feet of his disciples. Having done this he did a profoundly significant thing, he added to the ten commandments by giving them a “new commandment’ – that you love one another as I have loved you.” In Latin the word for commandment is mandatum which, in English, eventually got shortened in Maundy – hence Maundy Thursday. However even more significant that giving us a new commandment was what took place during the actual meal part of the Last Supper. The reason for the gathering was to hold a meal to celebrate the Jewish Passover. At its heart the highly ritualised Passover meal with symbolic food both recalls and celebrates the way God sent Moses to rescue the Jews from slavery in Egypt and lead them to freedom in the promised land. During the course of the meal Jesus adds a new chapter – Jesus has been sent to rescue us from a different kind of slavery and to lead us on a different kind of exodus to a new home. He takes bread and wine and gives them to us as a way of not just remembering but also participating in his sacrificial death and resurrection. Much later, probably around midnight Judas leaves and, after singing the Passover hymn, Jesus goes to pray in the quiet and secluded garden of Gethsemane. While here Jesus experiences the extreme stress and anguish of knowing what will happen to him in the morning. While he is still there Judas arrives and identifies Jesus to Temple guard who promptly arrest him. 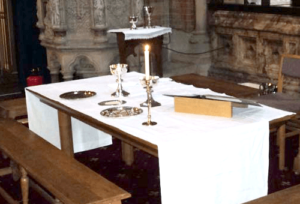 In Church our Maundy Thursday Eucharist reflects these three big events. After the readings and sermon the priest washes the feet of members of the congregation to remind all of us of the new commandment and how we are all called to be the servants of others. Then the focus changes and we remember and celebrate the Eucharistic sacrament that Jesus gave us in the Last Supper. Finally in order to remember the agony of Jesus in the garden and the way that everything – including freedom, his dignity and even his clothes were stripped from him we mirror this by stripping the altars and removing all banners, colour and moveable objects from the church leaving it bare and desolate for Good Friday. Although a separate day for us, in the biblical reckoning this is still the first day (see above). During the early hours of Friday morning Jesus was ‘tried’ and condemned by the High priests and the Sanhedrin. Not long after dawn he was taken to Pilate and there was a second and more official trial that took place while the city was still fairly sleepy. Pilate eventually gave in to the demands of the Jewish Sanhedrin and so Jesus was scourged and led off to be crucified. 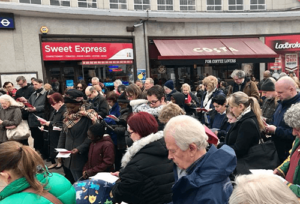 It is the custom for many local churches of different denominations to come together and take part in a Walk of Witness through their town in the morning of Good Friday prior to holding services in their own churches for the last hour of Jesus’ life. Jesus was put on the cross at 9 am and he died at 3pm (Mark.15v25 &33). He was then put in the tomb before the first day ends and the Sabbath began (sunset). Nothing visible happens on the second day (Friday Sunset to Saturday Sunset) this is the second day that Jesus body has been dead and in the tomb. The Third day begins at Sunset and at some point during the night the resurrection took place. The only thing we know for certain is that Jesus rose before dawn on the third day. By first thing in the morning “while it was still dark” (John 20.1) the resurrection had already taken place. For this reason the first big celebration of the resurrection takes place at some point after sunset on Saturday night, in our case at 9pm. The service follows quite an ancient format. We begin in semi darkness in the church where we keep a short vigil of readings, short prayer and songs as we recall the way God’s saving plan has unfolded. 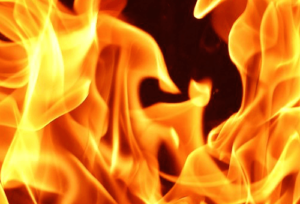 Then we go outside the church to a place where a bonfire or smaller and more contained fire is burning. The bonfire represents the fire of the Holy Spirit through whose power Christ was raised from the dead. 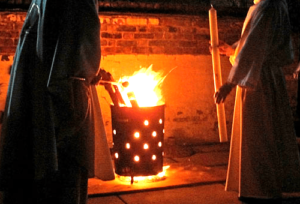 A flame is taken from the bonfire and used to light the big Paschal candle – which represent Jesus. The Paschal candle is then carried back into church and as everyone follows and comes back into Church the small candles they carry are lit so the light of the resurrection touches their lives and spreads out through the whole building. After the Paschal candle has been carried to the front of the Church a setting of the exsulet is sung and the church bursts into praise as we sing the Gloria and bells are rung and we celebrate the first mass of the risen Christ. Easter Sunday is more of the same. This is the day when we celebrate the end of Jesus’ mission here and his return to the Father. The disciples are obviously concerned and full of self-doubt at the fact that they will now have to manage without the bodily presence of Jesus to support and encourage them but it was vital for Jesus to return to the Father and be de-restricted physically for the next stage of the plan to begin. Before he goes Jesus has promised the disciples that he would send someone (the Holy Spirit- the third member of the Trinity) who would take over, empower them and stay with them forever. From a different perspective the Ascension is the day when all of heaven turns out to celebrate and welcome the conquering hero home. 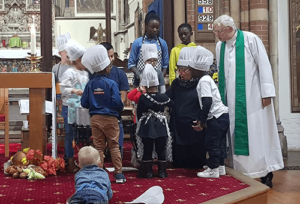 As the name suggests Pentecost takes place fifty days after our Easter celebrations and is the day when we remember the arrival of the next member of the team who takes over where Jesus leaves off. In Acts chapter 2 we are told that all the core group (the Disciples together with many of the others including Mary – see Acts 1.14) were gathered together and they were surrounded by two signs of the Holy Spirit that announce his arrival. Those present are then filled with the Spirit and are filled with new boldness and the abilities. It is the Holy Spirit who is our guide, our teacher and our advocate. 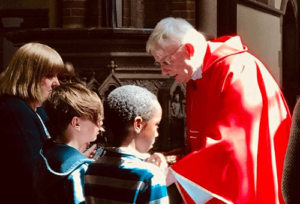 Strangely, there is no particular ceremony attached to Pentecost Sunday, though in some churches including ours, the congregation come to the altar and are anointed with the Holy oil of Chrism. There are two periods of Ordinary time in the church’s year, the short one begins after Candlemas and the very long one that begins the day after Pentecost. During Ordinary time we settle down and Sunday by Sunday we read our way through one of Gospels. In year A we read our way through St Matthew, in year B St Mark and in Year C St Luke. We read bits of John during Festival times. Having said all this we frequently interrupt the cycle of readings to celebrate special Holy Days and Saints days. The following are just a few of the major Holy Days. The Sunday after the arrival of the Holy Spirit at Pentecost we celebrate Trinity Sunday. The reason is obvious. As God’s plan had been gradually unfolding we have been getting more and more insights – glimpses into the mystery of what God is really like. We were told right from the very beginning that there is only one God but we had made the assumption that God is exactly like us – one ‘body’ or substance with one ‘person’ or centre of consciousness. But with the arrival of Jesus we realised that he too was some how part of God although separate from the Father. 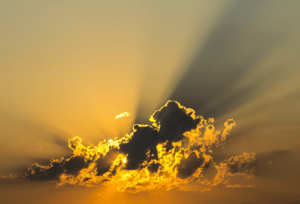 Then with the arrival of the Holy Spirit – clearly not a force or a power as had been thought in the Old testament but a separate person who had come to continue and connect us to the work begun by Jesus – we had to stop and rethink our view of God again. God is somehow one substance with three distinct centres of consciousness – three person – we haven’t clue how that works. But the really important thing to remember is that no one in their right mind would have invented such a confusing and vote losing idea. It’s just how it is! God is one and yet somehow also a community – perhaps that’s why belonging and groups and community are so important. On either the Thursday or increasingly the Sunday after Trinity Sunday the more catholic (Roman and Anglo-catholic) parts of the Western Church celebrate a special Holy Day called Corpus Christi. 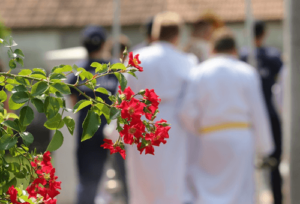 Corpus Christi are the Latin words for ‘the Body of Christ’ and as the name suggests the feast is the day when we give thanks and reflect on all that God gives us in the gift of Holy Communion. We think of it particularly as new manna or bread from heaven to feed and sustain us on our journey through the wilderness and also as the means by which we can encounter and welcome Jesus as he comes to us in and through this sacrament. In our churches we frequently have a procession within the service. The Host (the big altar bread) is placed in a special glass fronted frame called a monstrance so that people can be blessed by the presence of Jesus in the bread which is then carried in a procession around church or when practical in a procession from church to a special altar set up in a nearby garden. Most churches will hold a Eucharist on the days associated with the Apostles and major Saints. They will also hold a Eucharist on the day associated with the saint who is the patron of their church. (the saint to whom the church has been dedicated e.g. St. Andrew’s Church). That day is known as that church’s ‘Patronal festival’. All Saints Day is the day when we remember both the big and famous and also all those countless thousands of saints who will be honoured in heaven but whose names we will never know. There are two very good reasons for celebrating the saints. The first is that their life stories are like mini ‘Acts of the Apostles’ they continue the never-ending story of God’s involvement in the world – which means that we can learn more about God through them. The second is that the saints were (and still are) extremely ordinary and fallible people like us but when they opened their lives to Jesus he gave them the strength or the grace to do things they would never have thought possible. The saints are examples for us – they are the proof that it is possible to live, work and witness for Jesus in both ordinary and difficult situations. In a sense they are role models who show us that it is possible to live heroically for Jesus. We don’t stop caring for someone just because his or her physical body has died. As Christians know that death is not the end, the resurrection of Jesus proves that there is life after death. Nor are the dead simply unconscious or in cold storage until the last day. At the crucifixion Jesus promises the repentant thief ‘today you will be with me in paradise.’ Paradise is presumably the place where we await the final day. The New Testament talks of the departed as being like a cloud of witness (supporters who cheer us on) it also gives us glimpses that like Moses and Elijah at the transfiguration of Jesus they know not just the present but have insights into the future. 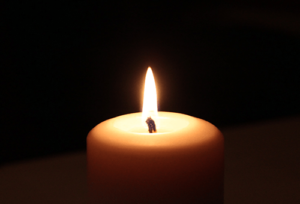 With this mystery in mind we have a special Eucharist in our Churches on All Souls’ Day when we give thanks for the lives of departed family and friends and those who have been significant in our lives, and ask our Heavenly Father to continue to look on them with his wisdom, his mercy and his love. This feast is held on the last Sunday of Ordinary time – the Sunday before Advent and as such it is the last Holy Day of the Church’s year (unless of course you celebrate St Andrew’s Day 30th November – which we do!!) On Christ the King we think about the way Jesus showed his true majesty when he sacrificed himself for his people on the cross. We give thanks for resurrection, for the Father giving him the name above all names and for the fact that he is now the King of Kings who not only loves us but who also delights in us.